This article is about the Luger pistol. For other meanings of parabellum, see Parabellum (disambiguation). The Pistole Parabellum—or Parabellum-Pistole (Pistol Parabellum), commonly known as just Luger—is a toggle-locked recoil-operated semi-automatic pistol produced in several models and by several nations from 1898 to 1948. The design was first patented by Georg Luger as an improvement upon the Borchardt Automatic Pistol and was produced as the Parabellum Automatic Pistol, Borchardt-Luger System by the German arms manufacturer Deutsche Waffen und Munitionsfabriken (DWM). The first production model was known as the Modell 1900 Parabellum. Later versions included the Pistol Parabellum Model 1908 or P08 which was produced by DWM and other manufacturers such as W+F Bern, Krieghoff, Simson, Mauser, and Vickers. The first Parabellum pistol was adopted by the Swiss army in May 1900. In German Army service, it was adopted in modified form as the Pistol Model 1908 (P08) in caliber 9×19mm Parabellum. The Model 08 was eventually succeeded by the Walther P38. The Luger is well known from its use by Germans during World War I and World War II, along with the interwar Weimar Republic and the postwar East German Volkspolizei. The P.08 was introduced in 7.65mm Parabellum, though it is notable for being the pistol for which the 9×19mm Parabellum cartridge was developed, also known as the 9×19mm Luger. The pistol has been used in fictional works by many villainous characters over the past several decades because of its association with Nazi Germany. Cutaway drawing of the Luger pistol from Georg Luger's 1908 9mm. patent. The Luger has a toggle-lock action which uses a jointed arm to lock, as opposed to the slide actions of many other semi-automatic pistols. After a round is fired, the barrel and toggle assembly travel roughly 13 mm (0.5 in) rearward due to recoil, both locked together at this point. The toggle strikes a cam built into the frame, causing the knee joint to hinge and the toggle and breech assembly to unlock. The barrel strikes the frame and stops its rearward movement, but the toggle assembly continues moving, bending the knee joint, extracting the spent casing from the chamber, and ejecting it. The toggle and breech assembly then travel forward under spring tension and the next round is loaded from the magazine into the chamber. The entire sequence occurs in a fraction of a second. This mechanism works well for higher-pressure cartridges, but cartridges loaded to a lower pressure can cause the pistol to malfunction because they do not generate enough recoil to work the action fully. This results in the breech block either not clearing the top cartridge of the magazine or becoming jammed open on the cartridge's base. This malfunction with under-powered cartridges does occur with Browning-type and other pistol designs as well, but the Luger is sensitive to cartridges other than the brass-cased ammunition which it was designed to use. Submachine guns were found to be effective in trench warfare during World War I, and experiments were conducted to convert various types of pistols to fully automatic machine pistols, including the P08. The Luger proved to have an excessive rate of fire in full-automatic mode, however, as did the Mauser C96. Luger pistols were manufactured in Germany and Switzerland to very close tolerances and exacting standards using the highest quality materials of the day, and original pistols were known for having a long service life. The design requires hand fitting of certain parts for proper operation. Assembling the gun using a sideplate from another pistol, for example, may prevent the sear from working, making the pistol inoperable. The Luger barrel, which was rigidly fixed to the barrel extension and carried the front sight, provided excellent accuracy. William B. "Bill" Ruger praised the Luger's 145° (55° for Americans) grip angle and duplicated it in his .22 LR pistol. The famous handgun author and revolver enthusiast Elmer Keith observed that the Luger design had been unfairly criticized by gun writers over the years as unreliable, partly due to poor experiences with Lugers constructed from salvaged parts. Keith noted that the Luger was a "natural pointer", one of the most accurate of all autoloading pistols—particularly at long ranges—and reminded critics that the Luger was the choice of more nations as their military sidearm than any other contemporary pistol or revolver. 'Artillery Luger' Lange Pistole 08 with 32-round Trommel-Magazin 08 and removable stock. A number of countries purchased the Model 1900 Parabellum in 7.65×21 mm Parabellum (.30 Luger) caliber and issued the pistol on a limited basis to officers, non-commissioned officers and mounted troops, including Germany, Switzerland, and the United States. The Model 1900 or Pistole Modell 1900 was issued to German officers and likely first saw combat in China during a bloody intervention by German troops in the aftermath of the Boxer Rebellion of 1900. On April 16, 1901, following a successful preliminary test of the Model 1900 at Springfield Armory, the U.S. Board of Ordnance purchased 1,000 Model 1900 Parabellum pistols with 4.75-inch barrels, marked with standard U.S. ordnance bomb proofs and "American Eagle" stamps over the chambers, and issued them to each troop of mounted cavalry of the U.S. Army for field testing, with the remainder to the light artillery and officers at West Point. In 1902, U.S. Army officials purchased another 50 Model 1902 Parabellum pistols with 4-inch barrels, again in 7.65mm Parabellum caliber, for further testing and evaluation. This was followed by a third test of 50 so-called "cartridge counter" Parabellum pistols in 9 mm caliber by Springfield Armory in 1904. Other nations either tested the Model 1900 or purchased small numbers for limited field service, including Austria, Brazil, Bulgaria, Canada, Chile, Holland, Luxembourg, Russia, Norway, Sweden, and Portugal. Commercial models of the Model 1900 were exported in quantity as well. In the U.S., Model 1900 pistols in 7.65 Parabellum caliber (aka .30 Luger in the U.S.) were first imported by Georg Luger, then by a DWM sales agent, Hans Tauscher, until World War I. Referred to at the time as the 'Borchardt-Luger' by U.S. authorities, Tauscher consistently referred to the pistol in his marketing and advertising materials as the 'Luger', after its inventor. Model 1900 pistols shipped to the U.S. were typically stamped with an American Eagle atop the barrel extensions. 'American Eagle' 7.65 Model 1900 pistols were used by variety of buyers, including American lawmen such as Stringer Fenton, outlaws, and Texas Rangers. After testing, the Swiss Army adopted the Model 1900 on April 4, 1901 in 7.65x21mm caliber as its standard side arm, designated Pistole 1900. This model uses a 120 mm (4.7 in) barrel and incorporates a grip safety and leaf-type mainspring. A later Swiss military contract with DWM resulted in the latter supplying improved Model 1900/06 pattern pistols designated the Model 1906 or Pistole 1900/06. Commencing in 1918, these Model 1906 Parabellum pistols were manufactured and assembled in Bern, Switzerland. In 1929, Swiss authorities adopted an improved version of the Modell 1900 designated the Modell 06/29 with improved sights, trigger and a stronger toggle link. Manufactured entirely at Bern, Switzerland, the 06/29 pistol served the Swiss Army until well after the adoption of a new service pistol in 1948, and was still in limited service in the late 1960s. In 1902 DWM introduced a slightly improved version of the Model 1900 Parabellum as the Model 1902. The Model 1902, with its shortened 4-inch barrel, was the first Parabellum pistol to be offered in 9x19mm Parabellum caliber, along with a change from four-groove to six-groove rifling. The Luger pistol was accepted by the Imperial German Navy in 1904 in 9mm Parabellum as the Pistole 04 (P04). The navy model had a 150 mm (5.9 in) barrel and a two-position ( 100 meters (110 yd) or 200 meters (220 yd) ) rear sight. This version was also referred to as the "Marine Modell 1904" or, more colloquially in the US as the "navy Luger". The Pistole 04 was later updated with a coil mainspring to Model 1906 pattern as Luger continued to refine and improve his design. Georg Luger introduced a new version of the Parabellum pistol in 1906 which would become known as the Model 1906 or New Model (Neues Modell). This latest version of the Parabellum replaced the old flat laminated main spring with a new, more reliable coil design. As all models of the Luger built after 1906 have the coil mainspring, they are known as New Models. Older Parabellum pistols in German service were usually upgraded to the New Model specification. By 1906, the United States evaluated several domestic and foreign-made semi-automatic pistols, including the Colt M1900, Steyr Mannlicher M1894, and an entry from Mauser. Although Springfield Armory had previously purchased 7.65×21mm Parabellum pistols for two separate field trials in 1900 and 1902, U.S. authorities had rejected the 7.65x21mm cartridge as insufficiently powerful for military use. In 1904, a small number of Parabellum pistols were tested in the then-new, more powerful 9×19mm round, but U.S. authorities again rejected the pistol. By this time, numerous adverse combat reports of insufficient stopping power of the Army's Colt .38 caliber revolvers used in the 1899-1902 Philippine Insurrection and the published findings of U.S. Army personnel obtained from the Thompson–LaGarde Tests resulted in a requirement for a military handgun in .45 (11.25mm) caliber. In 1906 and 1907, the U.S. Army held trials for a large-caliber semi-automatic pistol, which constituted the fourth and final evaluation of the Luger or Parabellum pistol design by U.S. authorities. At least two, and possibly three Parabellum Model 1902/1906 pattern pistols in enlarged form and chambered in .45 Luger caliber were brought to the U.S. by Georg Luger for the 1907 trials, each chambered in .45 ACP caliber. Prior to his arrival, the U.S. Frankford Arsenal had provided Luger with 5,000 rounds of .45 ammunition for experimentation and to serve as a guide for chambering measurements. Finding numerous defects in this prototype ammunition (U.S. authorities later were forced to produce new ammunition for the 1907 trials), Luger had DWM pull the bullets of these cartridges, which were re-loaded with a special faster-burning powder in new brass cases. Luger brought 746 rounds of this new ammunition to the March 1907 trials with his .45 Luger pistol. Two test .45 Luger pistols, bearing serial numbers 1 and 2 are known to have been used in the 1907 tests. Although the .45 Luger passed the firing tests, it was ranked below the Colt/Browning and Savage pistols in number of malfunctions and misfires, though Army officials conceded that the .45 Luger performed satisfactorily with the DWM-loaded ammunition. In the words of the testing commission: "The Luger automatic pistol, although it possesses manifest advantages in many particulars, is not recommended for service tests because its certainty of action, even with Luger ammunition, it is not considered satisfactory, because of the final seating of the cartridge is not by positive spring action, and because the powder stated by Mr. Luger to be necessary, for its satisfactory use is not now obtainable in this country.” DWM and Luger later rejected an invitation by Army officials to produce 200 pistols in caliber .45 for further competition against the Colt and Savage submissions, at which point DWM effectively withdrew from the U.S. trials. The fate of the .45 Luger, serial number 1 is unknown, as it was not returned and is believed to have been destroyed during testing. The .45 Luger prototype serial number 2, believed to have been a back-up to Serial Number 1, survived the 1907 trials and is in private ownership. Its rarity gives its value of around US$1 million at the time the "Million Dollar Guns" episode of History Channel's "Tales of the Gun" was filmed, recheck by Guns & Ammo as of 1994. At least two caliber .45 Luger pistols were manufactured later for possible commercial or military sales; one is exhibited at the R. W. Norton Art Gallery, in Shreveport, Louisiana. The other was sold in 2010 and remains in a private collection. A single .45 Luger carbine is also known to exist. In 1908, the German Army adopted the DWM Parabellum pistol as the Pistole Modell 1908 (P08) Parabellum to replace the Reichsrevolver in front-line service. The Pistole 08 (or P.08) had a 100 mm (3.9 in) barrel and was chambered in 9×19mm Parabellum. This version of Georg Luger's design reflected a number of improvements requested by German military authorities. The grip safety used on earlier versions was omitted, while a lug was attached to the heel of the pistol frame for attachment of a shoulder stock. The barrel was reduced in length to 4 inches (102mm), and the caliber was 9x19mm Parabellum, and the 9x19mm DWM cartridge (Catalog No. 278F) initially adopted by the German Army featured a 123-grain truncated-nose bullet design intended to increase wounding effect of the fully jacketed bullet. With slight modifications, notably the addition of a stock mounting lug and a hold-open latch, the P08 would serve as the German Army's principal sidearm during World War I, augmented by Mauser C96 and Model 1914 pistols. Over 2 million Luger pistols were used by German forces from 1914 to 1918. The Bolivian Army also adopted the DWM Luger in 9×19mm Parabellum in 1908 as an officer's sidearm; a few hundred were bought, starting with a batch of about 250 that were included in an order of 4,000 Mauser DWM 1907 rifles and 1,000 Mauser DWM 1907 short rifles. Subsequent Model 1908 purchases occurred each year until 1913. Only the first shipment had national crests bearing the legend "Ejercito Boliviano" stamped on the barrel extension. The adoption of the Lange Pistole 08 or LP 08, aka the "Artillery Luger", was authorized by the Kaiser on the 2nd of July 1913. This P08 variation was equipped with a 200 mm (7.9 in) barrel, an 8-position tangent rear sight (calibrated to 800 meters (870 yd)) and a board-type shoulder stock with an attached leather holster. In the event of close combat, the pistol was intended to be used as a carbine with the shoulder stock attached to a lug mounted on the heel of the pistol frame. When set for long range use the rear sight element visibly moves to the left to compensate for spin drift. While initially intended for use by German artillery units who could not be encumbered by the long and heavy K.98 rifle, the LP 08 was also used by Aviation units (prior to equipping aircraft with machine guns) as well as the Infantry, primarily on the Western front during World War I. The famous infantry Stoßtruppen or Stormtrooper units frequently employed the Artillery Luger equipped with a new large magazine – the 32-round Trommelmagazin or 'snail' magazine. Production of the LP 08 ended in 1918 with the end of the war. By that time, German troops had begun using the newly developed MP 18 submachine gun in place of the LP 08 for their stormtroop assault companies. However, by this time enough LP 08 barrels had been manufactured and stockpiled to fill LP 08 export orders into the 1930s. Carbine versions of the LP 08 were also produced commercially, with yet longer barrels. The firm Armeria Belga of Santiago (Chile) also manufactured a detachable stock, the Benke Thiemann stock, that could fold out from the grip section. In the early 1920s, carbine production was restarted, with barrels up to 600mm (24 in) long. Under a small contract, LP 08 or Artillery P08s were assembled in the 1930s to fill an order from the Shah of Iran for his artillery troops, with some of these weapons ending up with Thai police forces. Existing LP 08 pistols which had remained in storage were re-issued in WWII with new-production board stocks for some German units such as artillerymen and Waffen SS units, and these continued in use until the end of the war in 1945. From 1919 on, DWM rebuilt P08 frames with new parts or existing parts (including barrels) into complete pistols for sales to the civilian and export markets. These sales helped restore DWM to solvency after the Armistice. Most of these commercial pistols were in 7.65 Parabellum (.30 Luger) caliber, although a number of pistols were also rebarrelled to 9mm Parabellum (9x19mm). The new component parts were stamped with serial numbers to match the frame to ensure that all the fitted parts stayed together. Many thousands of these pistols were thought to have been assembled and sold between 1919 and 1923. Some of these pistols were fitted with new barrels of different lengths by the importer upon customer request. Many so-called 1919 and 1920 Commercial Lugers were imported to the United States by such firms as Abercrombie & Fitch, Pacific Arms Co., and A.F. Stoeger Inc. The latter importer sought and registered the name Luger in 1929 in the United States. In 1923, A.F. Stoeger Inc., the predecessor to Stoeger, Inc. began importing commercial pistols from DWM stamped A.F.Stoeger Inc. – New York. and "Germany". These pistols were exported to the United States in both 7.65 Parabellum (.30 Luger) and 9mm calibers, with barrel lengths from 75 mm to 600 mm. These imported Parabellums were also the first pistols to bear the name "Luger", roll stamped on the right side of the receiver. That same year, DWM also signed contracts to supply small numbers of P08 pistols to the armed forces of Finland (8,000 pistols, designated m/23), the Netherlands, and Sweden. Until 1930, DWM continued to export both P08 and commercial Parabellum pistols to nations in Europe and to overseas markets, including the United States and the Far East. Although never officially adopted by Nationalist forces, all variants of the Parabellum or Luger pistol were highly sought after by both Chinese Nationalist officers and irregular guerrilla forces. In 1924, just before the outbreak of the Chinese Civil War, a review of Chinese Nationalist small arms reported that "Among officers, bodyguards, and police, the German Parabellum (Luger) 9-mm automatic pistol was the weapon of choice...". In 1930, Mauser took over manufacture of the P.08 from DWM. Additional P08s were produced by Simson and later Krieghoff. Many P04 and P08 pistols would continue in service with German army and navy personnel throughout World War II. Towards the end of 1937 (beginning with 't' & 'u' block pistols) Mauser phased out rust blue process and "straw finishing" small parts and levers on the P08, choosing to salt blue all parts of the weapon at one time. In 1941 some of these pistols were fitted with inexpensive black Bakelite grip panels to cut production time and expense. Years after the war, these pistols would be given the name "Black Widow" by a postwar US arms dealer as a marketing ploy. The P08 was technically replaced in service in 1938 by the Walther P38, but ever-growing wartime demands for handguns resulted in continued P08 production by Mauser until December 1943. Mauser production was supplemented by a small contract for Luger pistols given to Heinrich Krieghoff & Son of Suhl in 1935 to produce a Luger variant for the Luftwaffe; a second contract for 15,000 pistols was only partially completed when Krieghoff ceased Luger production in 1944. The German Army took their last delivery of 1,000 Mauser-made pistols in November 1943. A further 4,000 pistols assembled by Mauser in December of that same year were sold to Portugal, which renamed them the Model 943. German military authorities refused to take any more Luger pistols, leaving a large stock of parts at the factory in Oberndorf. Captured Lugers were much prized by Allied soldiers during both of the world wars as war trophies. However, during World War II, German soldiers were known to sometimes use a discarded Luger pistol to lure unsuspecting trophy hunters, rigging it to detonate land mines or hidden booby traps when disturbed. Word also spread of accidental discharges and deaths of Allied troops by users unfamiliar with the P08 and its safety mechanisms, as well as stories circulating that American soldiers were being executed if captured in possession of German weapons. Although Mauser P08 production terminated in 1943, the P08 re-appeared in postwar form because of a continuing demand for handguns for military and police requirements. In 1945 Mauser restarted Luger production under the control of the French occupation authority to supply the French military and occupation police forces. Assembly commenced under French control from June 1945 until mid-1946. In the second half of 1946, tooling and some Mauser personnel moved from Oberndorf to Chatellerault in France, the location of MAC (Manufacture d’Armes de Chatellerault) to continue assembly from existing parts stocks. About 4,000 Luger 'parts' pistols, including a few LP 08 models, are thought to have been assembled for French forces, a sufficient number to justify the production of new-manufacture Luger magazines in France for several years. Surviving examples of Lugers assembled under French supervision are usually found with a distinct, gray parkerized finish. A few early French control pistols bear a five-pointed star proof mark known to have been used by French Occupation authorities. Later pistols assembled in France often carry a French arsenal/manufacturer name, such as Manufacture Francaise d’Armes & Cycles de St. Etienne (Manufrance). Surviving French Control Lugers were retained in French storage depots as late as 1970. Pistols were also assembled under the direction of Soviet (and later, East German) authorities to arm military and MP units, as well as the VOPO secret police. During the immediate postwar period, complete Luger pistols were also assembled from rejected or salvaged parts with different serial numbers, then sold as souvenirs to occupation forces in Germany. Thousands of original Luger pistols were taken home by returning Allied soldiers after both world wars. Other Luger pistols were later assembled in the United States by gunsmiths of varying aptitude using secondhand, rejected, or salvaged parts imported from Germany and other countries. These pistols and their construction quality (or lack of it) would contribute to criticism of the Luger as a finicky and unreliable weapon. However well maintained Luger with new springs and suitable cartridges is a very reliable weapon. The Swiss Parabellum 06/29 continued in production until 1946. In 1969, after purchasing the Swiss 06/29 tooling, Mauser Werke in Oberndorf restarted Parabellum production, which ceased in 1986 when the last commemorative model was produced. While new Mauser Luger production ended at this time, pistols continued to be assembled and sold from parts on hand until the 1990s. 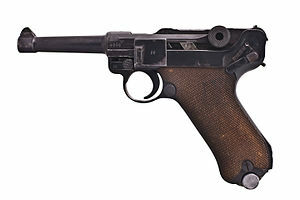 The Luger pistol is still sought after by collectors both for its sleek design and accuracy, and for its connection to Imperial and Nazi Germany. According to Aaron Davis, writing in The Standard Catalog of the Luger, "From its adoption, the Luger was synonymous with the German military through the end of World War II" and "Ask any World War II vet of the [European Theater of Operations] what the most prized war souvenir was and the answer will invariably come back, ‘a Luger.’” Colonel David Hackworth mentions in his autobiography that it was still a sought-after sidearm in the Vietnam War. Vietnamese gunsmiths even copied the basic Luger design, producing a few crude 'Luger' pistols with which to arm Viet Cong and other irregular forces. Democratic Republic of Georgia: Mainly issued to officers. Empire of Japan: Used Luger pistols in a semi-official capacity taken from disarmed Dutch forces in Indonesia. East Germany: Used by the Volkspolizei and Stasi agents. Netherlands: Dutch arms factories made Lugers in 1912 for use by the Dutch East Indies Army. Other contracts were completed for the Dutch Navy commencing in 1923, and the Dutch Air Force in 1928. Indonesia: Almost 14,000 Dutch KNIL M.11 Lugers were in Indonesia before the Japanese occupation of the Dutch East Indies. As such, the Luger was widely used during the Indonesian National Revolution. General Sudirman is known to have personally carried an M.11. New Zealand: Captured Lugers issued to RNZAF ADS officers 1942-45. Norway: In use from 1945 and phased out in 1987. Republic of China: Used by Chang Tso-lin's warlord army. United States The U.S. Ordnance Board purchased 1,000 Model 1900 7.65mm pistols under an official military contract order and issued them to active duty cavalry troops for field testing. ^ a b Jowett, Philip; Snodgrass, Brent (5 July 2006). Finland at War 1939–45. Elite 141. Osprey Publishing. p. 46. ISBN 9781841769691. ^ German Infantry Weapons. United States War Department. 25 May 1943. p. 5. ^ a b c Fitzsimons, Bernard, ed. (1977). "Luger". The Illustrated Encyclopedia of Weapons and Warfare. 16. London, UK: Phoebus. p. 1778. ^ a b c d "DWM Luger P-08 Pistol". chuckhawks.com. Retrieved 12 May 2017. ^ Hogg, Ian; Weeks, John (2000). Military Small Arms of the 20th Century (7th ed.). Iola, Wisconsin: Krause Publications. ISBN 0-87341-824-7. ^ a b c Walter, John. The Luger Story. Greenhill Books. p. 127. ISBN 1-85367-436-2. ^ U.S. Naval Institute Proceedings, Vol. 27 No. 1 (March 1901), p. 436: "The Board...has recommended that $15,000 be appropriated for the purchase of $1,000 of the Luger automatic pistols, which recently made such a wonderful record in the tests at Springfield Armory. The sum allotted—for the recommendation of the Board was instantly approved by the Secretary of War—is sufficient to furnish five of these pistols for each Troop of Cavalry in the service..."
^ a b c Datig, Fred A. (20 April 2009). "The Luger Pistol | Gun Digest". Gun Digest. Retrieved 6 September 2017. ^ "Tales of the Gun: Million Dollar Guns". History Channel – via YouTube. ^ James, Garry (October 2010). "Would you Shoot the Million Dollar Luger". Guns & Ammo. InterMedia Outdoors. Archived from the original on 4 June 2013. ^ "Investment Firearm – .45 Luger Carbine". rennlist.com. Archived from the original on 15 November 2004. ^ a b Huard, Paul Richard (6 March 2015). "The Nazis' Handgun". War Is Boring. Retrieved 6 September 2017. ^ Davis, Aaron, Standard Catalog of Luger, p. 25: In 1922 DWM became part of a holding company, Berlin-Karlsruher Industrie-Werke (BKIW). ^ a b c d Bishop, Chris, ed. (2002). The Encyclopedia of Weapons of World War II. Metrobooks. p. 228. ISBN 1-58663-762-2. Retrieved 2 March 2010. ^ Bishop, Chris, ed. (1998). The Encyclopedia of Weapons of World War II. New York: Orbis Publishing Ltd. ISBN 0-7607-1022-8. .
^ Hackworth, David H. (1990). About Face: The Odyssey of an American Warrior. New York: Simon & Schuster. ISBN 978-0-67169-534-7. ^ McCollum, Ian (27 January 2016). "Viet Cong Handmade Luger Lookalike". ForgottenWeapons.com. Retrieved 12 December 2017. ^ a b c d Walter, John (1991). Luger Book: The Encyclopedia of the Borchardt and Borchardt-Luger Handguns, 1885–1985. London, UK: Arms & Armour. p. 66. ISBN 978-0-85368-886-0. ^ Miller, David. Fighting Men of World War II, Volume I: Axis Forces — Uniforms, Equipment, and Weapons. Stackpole Books. p. 369. ISBN 0-8117-0277-4. ^ a b c Davis, Aaron (2006). Standard Catalog of Luger (2nd ed.). Gun Digest Books. ISBN 0-89689-411-8. ^ JWH1975 (18 October 2015). "Urgent Fury 1983: WWII weapons encountered". wwiiafterwwii. Wordpress. Retrieved 13 December 2017. ^ Grey Tiger (2015). "World Infantry Weapons: Libya". WorldInventory. Retrieved 13 December 2017 – via Google Sites. ^ Hæren etter Annen verdenskrig: 1945–1990 [The Army of the Second World War: 1945–1990] (in Norwegian). Oslo: Fabritius. 1990. p. 563. ISBN 8290545169. ^ Telo, António José; Álvares, Mário (2004). Armamento do Exército Português, Vol.I – Armamento Ligeiro [Armament of the Portuguese Army, Vol.I - Light Armament] (in Portuguese). Lisbon: Prefácio. pp. 100–103. ISBN 972-8816-43-X. ^ a b Arnold, David W. (11 November 2010). "Classic Handguns of the 20th Century: The P.08 German Luger". Handguns. Retrieved 12 May 2017. ^ Jowett, Philip (2010). Chinese Warlord Armies 1911–30. Oxford, UK: Osprey Publishing Ltd. p. 21. ISBN 978-1-84908-402-4. ^ Cite error: The named reference Lugerarticle was invoked but never defined (see the help page). ^ "The Weapons: Semi-auto Pistols". lebaneseforces.com. Archived from the original on 2 April 2015. Retrieved 12 March 2015. ^ Stewart, Major Michael P. "Art of War Papers" (PDF). Retrieved 12 March 2015. Bishop, Chris (2002). The Encyclopedia of Weapons of World War II. Sterling Publishing Company, Inc. ISBN 978-1-58663-762-0. Rottman, Gordon (2011). World War II Axis Booby Traps and Sabotage Tactics. Oxford, UK: Osprey Publishing. ISBN 178096143X. OCLC 650113182. Wikimedia Commons has media related to P08 Parabellum. Mauser Parabellum (INTERARMS) Certification Service from the Original Mauser Production Ledgers.